Car Access: The hike starts from Cooks Mill Campground, which is best accessed via the Maroondah Highway. Turn right on Cathedral Lane, just after Buxton (look out for the Cathedral Range State Park sign. From Cathedral Lane, the way to Cooks Mill Campground is well-signed. Whenever a visitor to Melbourne asks me to take them for a hike, Cathedral Range State Park is the first place that springs to mind. I’ve done the two main day-hikes here now and they both fit all of my criteria for an amazing day out. If you aren’t good with heights this one might be the better choice for you, since the Southern Circuit begins with a short section of what I’d almost call rock climbing (well, it’s the closest I’ve ever come to rock climbing anyway). The Southern Circuit is actually my favourite, but I’ve chosen to take a couple of people here instead because they weren’t so crazy about heights. It definitely comes a close second for me. At Cooks Mill Campground, find the signed track that leads to Jawbone Carpark (close to the toilet block). The gravel entry road might be a quicker way to get there, but this is a much nicer walk. If you’ve started early in the morning, there’s a good chance of seeing Eastern Grey Kangaroo’s grazing alongside the track. When you arrive at Jawbone Carpark, find the continuation of the walk on Jawbone Creek Track. This crosses the creek and then takes you steeply up Cathedral’s eastern slope. 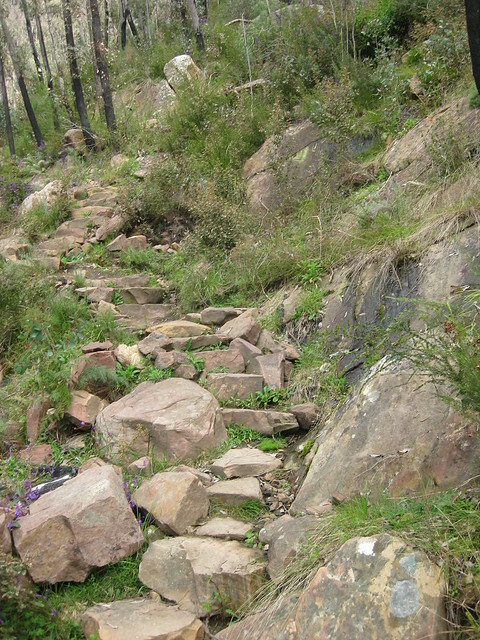 The track soon turns into a rocky staircase which has been very well built by the Friends of Cathedral Range State Park. In spring and early summer, this is a great place to admire the variety of wildflowers. You’ll be glad of the excuse to stop and catch your breath. When you reach the first track junction (on your right), the worst of the climbing is over. Take this unnamed track until you find the short detour to North Jawbone Peak. The detour won’t take long and is worth it for the views of The Razorback and Sugarloaf Peak to the south, and across Little River Valley to the east. Retrace your steps back to the unnamed track and then continue on it to Ridge Track. Though I’m very unfit, I actually found the ridge traverse far more challenging than the climb on Jawbone Creek Track. There are no major climbs but the scrambling takes its toll on your legs, knees and ankles. You really have to concentrate on where you’re putting your feet too, so it’s very slow going. Continue past the turn-off to Ned’s Saddle and take in Cathedral Peak. The track takes you away from the ridge-line at this point, so keep an eye out for the orange markers. At the next track junction, take the short detour to check out Little Cathedral. Retrace your steps once again, this time taking the other track to Ned’s Peak. The final peak for the day requires another short detour. There are no views to speak of at the top so you may prefer to skip it. I couldn’t resist one final challenge. Descend the range on Ned’s Gully Track and then enjoy a nice easy stroll on Little River Track, back to Cooks Mill Campground. Cathedral Range Southern Circuit is another excellent day walk, which basically covers the other half of Cathedral Range. 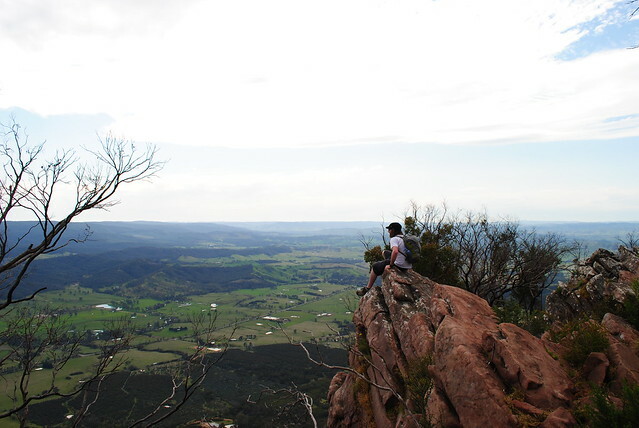 Have you visited Cathedral Range State Park? If you have any stories, updates or corrections, please let us know by commenting below. I honestly don’t think it would make too much difference going the other way but I’m not speaking from experience. As for water, it’s a tough call especially when every litre is a kilo and I’ve never found the water source up there very reliable. I’d say carry at least 3-4 litres per person but you’d have a better idea than me how much you’ll drink. Be aware that your day one is gonna be pretty tough and slow going, especially for your 9 year old. 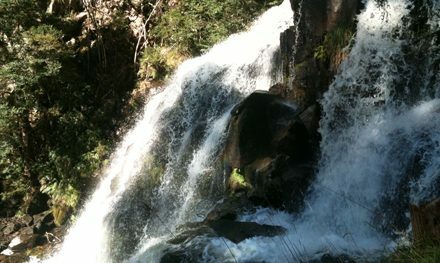 It might be worth signing up over at Bushwalk.com if you haven’t already and ask if anyone there has checked out the creek lately. Hope that helps! My partner and I did this lovely walk yesterday. There were trees down in a number of places along the track which made it extra tricky. We heard a few crack and come down overnight while we were camping too – I guess because it’s so dry? There were lots of kangaroos and sweet little leadbeater possums around in the evening too. Happy new year to you both! Glad to hear you enjoyed the hike. Yeah, more trees/branches do seem to come down when it’s dry. I guess that makes sense. I don’t think I’ve ever spotted a leadbeaters possum in the wild. Nice! Hopefully I get to see one too, before they’re all gone. :/ If you haven’t already, try out the southern circuit too. It’s heaps of fun! Hey Neil, great blog. Thanks! 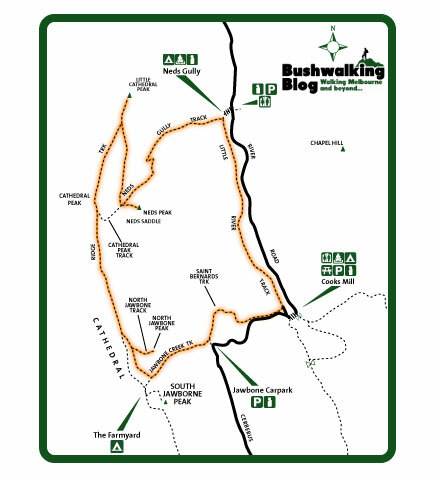 I’m thinking of tackling Cathedral over two days, joining southern with northern track via Razorback Ridge Track and camping overnight up top at The Farmyard. Any thoughts, tips? I realise of course I’ll need enough water with me. Are there any more detailed maps around than the standard one Parks Vic publishes? Glad you like the blog. That’s a great idea for a hike. No particular tips, except that the track between Sugarloaf Saddle and Sugarloaf Peak can be a bit hairy, especially with a big pack on. I’m yet to find a proper topo map of Cathedral Range and I’m not sure if one exists. No worries, thanks. There’s ‘Friends of…’ group I believe; they might have some local knowledge worth tapping into. Will keep the Sugarloaf area in mind and my poles close at hand! Thanks for the great blog Neil. Walked the northern section over the Easter break. Had a look at Ten fathom ridge, Ned’s peak and the Cathedral peak. Several people have said that Ned’s peak isn’t much to look at, but if you follow the ridge down to the end you get a good view down over Ten fathom ridge and along the valley. Also on Ned’s peak I came across several slabs of sandstone that had ripples on them from when the sand was the sea floor. This was a highlight for me. Again thanks for the great info. Thanks for the comment. Glad the blog post was helpful. I love Ned’s Peak but I’m not sure I’ve seen the spot you’re talking about. Nice work spotting the ripples. Will have to look out for those next time I’m up there. You definitely should, Karn! I actually still prefer the southern section, but this comes a very close second. Enjoy the hike, and feel free to come back and let us know how you go. Hi Neil. this looks like a great detailed blog. We will be attempting this tomorrow. lets hope we make it! Oh and as previously commented by other people, the walk back to the carpark up the gravel road was a killer haha! I cannot thank-you enough for this blog. This is the second circuit I’ve followed from here & I was absolutely blown away today by the breathtaking views! What a day. I can barely walk but it has been the greatest & yet most difficult hike I’ve been on. Can I just say that road to trek back to the carpark should be renamed as the never ending hill! Definitely tested me. Your directions are still up to date perfectly. I cannot thank YOU enough for this comment! 🙂 Seriously, these are the comments that make all the work I put into Bushwalking Blog worthwhile. I really appreciate it. I’m so glad you enjoyed the hike! It’s definitely one of my favourites and yes, I do remember my legs being a bit wobbly by the time I descended the range. The friends I was with last time I did this one would definitely agree about the hike back to the car. I kept telling them “5 more minutes” so that they didn’t give up haha. I hope you’ll subscribe and keep reading, and don’t be a stranger! I love hearing from anyone who stumbles across my online home. 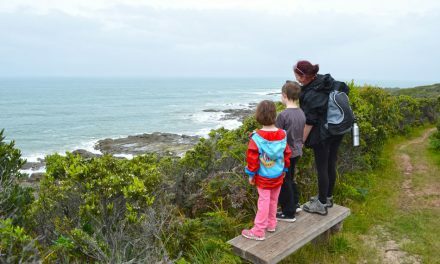 We did this walk a couple of weeks ago following your instructions and had a really fantastic day out as we were treated with perfect Melbourne winter weather, lovely views and many wildlife sightings. I think we must have been very lucky that day as we saw eastern grey kangaroos, rock wallabies, several lyrebirds, two koalas and even a wombat! 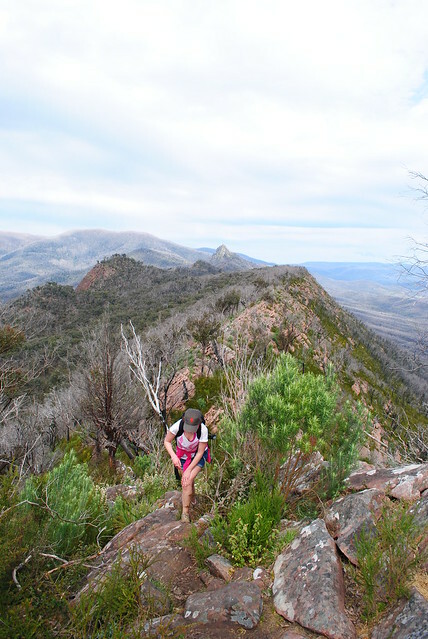 Thank you for your blog; we are looking forward to our next walk (possibly the Southern Circuit of Cathedral Ranges). If you have a chance, feel free to check out our Instagram account (www.instagram.com/theworldatourfeet) for some pictures we took along the way. Unfortunately most of the wildlife were too quick to capture on camera so we just had to appreciate the moment! Sounds like you had a fantastic day out! Nice work on all the animal sightings. 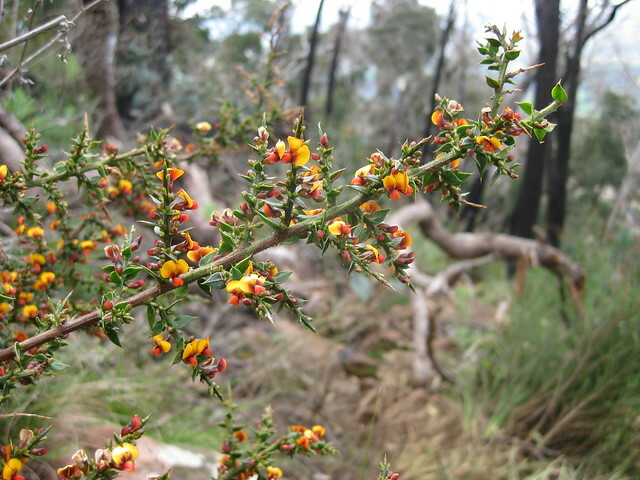 Thanks for the kind words about Bushwalking Blog. It’s always fantastic to hear that people find it helpful. I highly recommend the southern circuit if you get a chance. Nice photos on the instagram too, by the way! Thanks for the awesome blog, I found it to be most beneficial and easy to follow. I intend on doing the Northern Circuit hike in a couple of days, but was wondering if I will have trouble accessing the Cooks Mill Campground due to the logging? If there is no access, are there any alternative entry points for the Northern Circuit hike? I’ll be doing a day hike and won’t be camping. Great to hear you’re a fan of the blog. I’ve always tried to make the walks easy to follow, so I’m glad I’ve succeeded. Please let me know if you ever have any criticisms, too. Apologies for not getting back to you earlier but I’ve been on the road for a week or so. I’m guessing my reply won’t be much help to you now but I’m not sure about the answer to your question anyway. I was under the impression that access was to reopen in late December. I’ve done both the Northern/Southern circuits following your advice and both times spot on !!! Great write up, thanks so much for sharing. I personally preferred the “Northern Circuit” and when I did the Southern…..I chose “Canyon Track” as opposed to the Cave Track (Yes…I do have a respect for heights). I will be revisiting the Northern Circuit again on weekend December 14-15th 2013. This park has become a true favourite for me and there is something about it that just draws one to it. 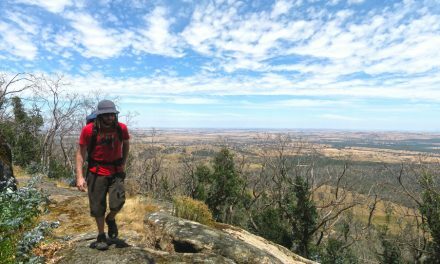 I’m so glad to hear that you’re finding Bushwalking Blog useful, and that you seem to love Cathedral Range as much as I do. I don’t know what it is either, but I feel incredibly drawn to the place. You might have trouble getting access to the Northern circuit that weekend, unfortunately. They’re currently working on bridge repairs and the road is closed until the 20th – http://bushwalk.com/forum/viewtopic.php?f=37&t=15556 – You might be able to try the alternative route mentioned in that forum post, but I think it would require a 4WD. Hi Neil. Just completed this circuit today based on the info in your blog and had an awesome day of walking. The views from the Ridge Track and all the peaks (except Neds) were amazing. All up it took me seven hours including half hour rests at North Jawbone, Cathedral and Little Cathedral Peaks plus plenty of photo stops. No eastern grey kangaroos but saw plenty of lizards and also mountain goats below me at Cathedral Peak. After reading the comments about the prickly weeds I decided to wear long pants and gaiters and it made all the difference. Not one scratch. Can’t wait to complete the southern circuit now. Thanks again for the great info in your blog. So glad to hear the blog was helpful. Mountain goats!? I’m yet to see any of them out at Cathedral, but I guess it’s the perfect environment for them. Yes, definitely check out the southern circuit. If you liked this one, you’ll absolutely love the south. Have fun! Thank you for this blog! Just did the hike on the weekend following your guide and totally enjoyed it, especially the ridge which was definitely the highlight of the trek for us with stunning views! We only did the North Jawbone Peak (skipped the other 2 peaks) and it took us 6hrs altogether (approx 10.5kms). After the Ridge Track, is Ned’s Gully Trek which we found quite slippery. While it didn’t rain the night before, the track was very dry which made it slippery in some places as it is descending the majority of the time. The only annoyance was the prickly weeds which were quite painful sometimes (I would recommend to wear long or at least three quarter length pants) as they are overgrowing onto the walking path. The track was generally well marked with orange arrows which was great as we are not experienced hikers, so we looked to them for comfort to make sure we were on the right track. Thanks again for all the info! Great hike! Thanks a ton for the info. It was very helpful, really enjoyed the northern track. Can’t wait to check out the southern one. So glad the blog post was helpful! The northern circuit is incredible, but I think the southern circuit might be my favourite. Enjoy! We did this walk on sunday, thanks for the info from this site. I tracked the walk with GPS and although a few tracks were closed and we had to find alternatives, we basically followed this guide. It took us 7 hours (slow going due to the rocks and the bloody stinging weeds we were constantly getting ripped at by) and my GPS gave me a total distance of 21.9km’s, just walking the road from Neds gully camp site to cooks mill camp ground was 3.5km’s. 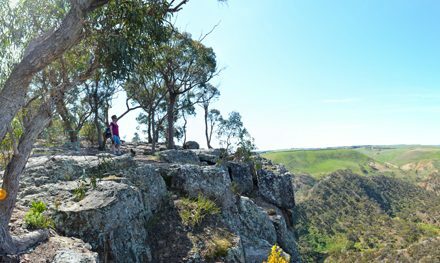 The walk was fairly tough in places, especially traversing the ridge track, but the views you are rewarded with are spectacular. We recommend this walk to anyone who is willing to take to the challenge. Thanks again, Richard and Joan. P.S. Doing 4 brothers next weekend. Thanks very much for the update guys! Those weeds ripped my legs up something shocking… Almost convinced me to wear gaiters or long pants next time (almost). I hope you enjoy Four Brothers! Let us know how you go.